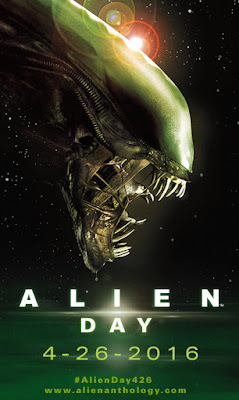 Jack-o'-Lantern Press: Alien Day is here! Alien Day began with a bang. More like a splat. On this 26th day in the 4th month of the year, folks from all walks of alien life are getting into the act of commemorating the alien life form from the exomoon LV-426, where the USCSS Nostromo encountered alien eggs a long time ago in a galaxy far -- never mind, wrong franchise. Hundreds of crawlers have initiated daylong games of hide-and-go-mutilate, while others have waged war on human colonies founded on other exomoons. The day began with the first alien to emerge from some lucky human’s chest at 12:01 a.m. on planet Earth. Facehuggers are celebrating the day as well, taking their joy to the streets. All over the many worlds in several galaxies everywhere, these eight-legged, long-tailed parasitoids have been in search of faces to hug and hosts to implant their proboscises for implantation. No facehugger could comment due to their inability to speak. Live bands and other entertainment have provided a backdrop for all the activity today. Plus, the Weyland-Yutani Corporation, which operates several human colonies through the Extrasolar Colonization Administration and was instrumental in exploiting humans and androids to get their hands on the Xenomorph alien species, is offering a dizzying array of food trucks and children’s activities all around the universe. Other “things” to keep watch for during Alien Day can be found at Collider.com right HERE. Check it out. We at Jack-o’-Lantern Press hope you make it a great day today. Please, don’t be safe. And keep us updated on the happenings of the day via our Twitter and Facebook pages.